From the creators of Professor Fizzwizzle comes FizzBall, an effort which probably comes the closest to replicating BreakQuest's success but with it's own gameplay mechanics. The puzzle element has been ditched by Grubby Games, in favor of an action game to draw in more players. Essentially a Breakout clone, the comical style from it's predecessor has been retained and improved in this iteration with more animation and additional characters. 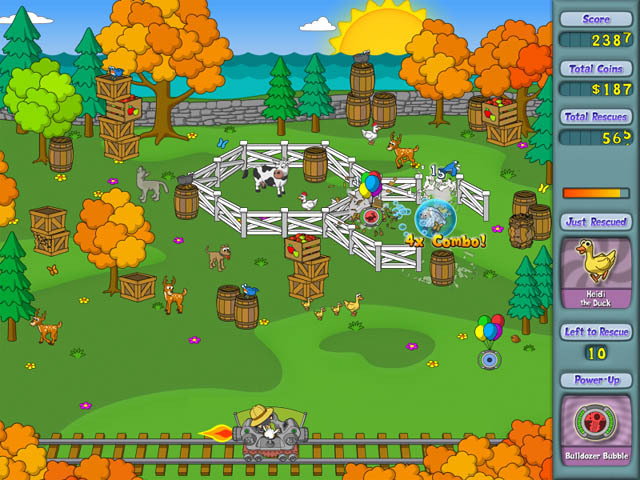 Professor Fizzwizzle has to capture animals by bouncing the FizzBall his invention and trapping them inside the bubble after it gains a certain size. The ball can be used to smash obstacles, shake trees and grab bonus items among other things. One talking point is the contraption's ability to blow the Fizzball upwards, it's use only limited to the amount of energy left as displayed on the right. Features over a hundred and eighty levels, complete with over fifteen types of power-ups to collect.